As a courtesy to other tenants, users are kindly requested to cancel their reservations 24 hours prior to the scheduled time. Otherwise, a $50 cancellation fee will be charged to their account. With 5 conference rooms,1 modern meeting lounge and a private office, Newport Office Center Executive Suites is able to meet and exceed your meeting requirements. 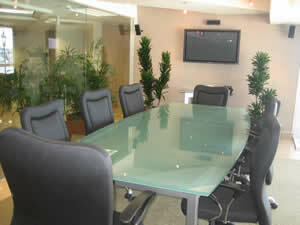 As a courtesy to our other tenants, we kindly ask that the conference room be left neat and organized after each use. Please push all chairs back under the table, turn off lights and dispose of any trash. Otherwise, a $50 clean up fee will be charged to the user's account. Thank you. This conference room seats up to 8 people. The rental rate is $40.00 per hour.